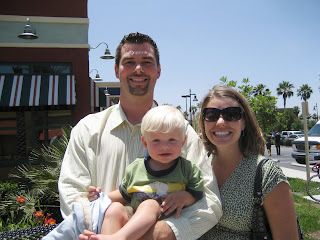 While we were in Havasu Matt's sister Annette and Dan were out visiting. Annette came by herself and got to celebrate her birthday out here. While we missed being able to see them, we were able to see everyone for a few hours on Sunday after we got home. It was fun to hang out and BBQ and chit chat. 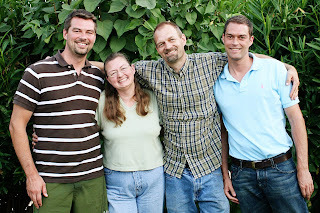 I made everyone take some pictures because it is not often that all four Hekman kids are together in the same place. Being silly.... speak no evil, hear no evil, see no evil. Ethan had fun playing with his cousins and playing in the playhouse. All the kids love running around Grandma and Grandpa's big yard. 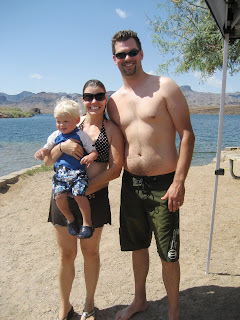 We are back from Havasu and we had a great trip. It was fun to be away from home and our normal routine. Our good friends Thomas and Leighann were kind enough to invite us to come out and stay at their Havasu house with them and play on the lake in their boat. We got out there Thursday night, then spent Friday and Saturday on the lake and came home this morning (Sunday). We managed to stay cool in the heat (by pretty much staying in the water a lot), and had lots of fun riding in the boat, playing on the beaches we staked out and swimming in the water. Here are some pictures from my handy dandy point and shoot (I didn't feel like carting my DSLR around). Our little family on the beach we staked out on Friday. I just wanted to thank you guys for the outpouring of prayers and support as I struggle during this difficult time. It really means a lot to me. I appreciate your continued prayers :) In the meantime it's kind of hard to blog, so I'm not even going to try. I cling to the hope of the Lord and tell myself daily that this WILL pass and things WILL get better. We are leaving this afternoon to go to Havasu with some friends. I'm looking forward to it, but also nervous about how I will handle the heat being this pregnant. I guess we'll just play it by ear and hope for the best :) I'm bringing along my point and shoot camera, so I'll at least have a few pictures to share when we return. We had a nice Father's Day. We gave Matt his present and went to church. After church we had lunch with Matt's parents and his brother Mike and family at Chilie's. The kids did well and we were able to enjoy a nice lunch together. Ethan was so very tired and he crashed as soon as we got in the car. Later that afternoon my brother came over and we BBQd hamburgers upon Matt's request. The weather was gorgeous yesterday as well. Father's day is a mixed bag for me. I am excited to celebrate it with Matt and Ethan, as Matt is such an amazing father. Yet I'm sad because I miss my own father, who's been with our Heavenly Father for 7 years now. This ABC zoo site is also a fun one. The past couple of days Ethan likes to pretend to talk on the phone to his daddy. I think it's pretty cute and it melts Matt's heart :) I was holding him on my lap, so the video isn't the greatest. I decided to enter the weekly contest on the iHeartFaces blog for the first time this week. I took this photo of my nephew Stephen a few weeks back. I just love his little smile and his bright eyes. Who says you can't wear shoes with footed jammies? Lately Ethan has insisted that he have shoes on, even over his jammies. It's pretty funny. He also likes to try to wear our shoes, although he can't walk in them very well. 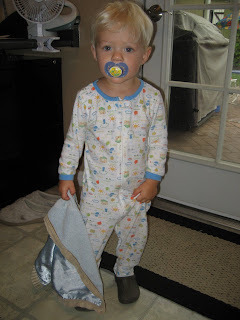 Here is a video clip of him walking in his jammies with my sandals on the wrong feet. I am about 3/4 of the way through this book. I haven't really ever listened to Dr. Laura because I have satellite radio, and this is the first book of hers that I've read. I have to say it is very encouraging. Sometimes being a stay at home mom can be a thankless job, but this book has really encouraged and affirmed me in what I do day in and day out. 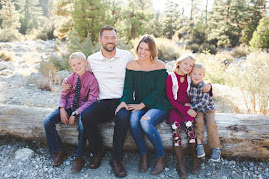 I know there are many of you who read my blog that would probably love to stay at home and work out of necessity, and I certainly don't post this to make you feel bad. I was just encouraged by this book and wanted to share it. I needed a book like this right about now :) It really made me appreciate all the little things about life right now as a mom at home with a little one. This weekend we were fortunate to get to go to Vegas together. Matt's mom watched Ethan on Friday and my mom had him the rest of the weekend. It was such a nice wonderful treat to get away for an entire weekend together. 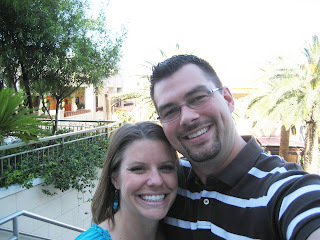 I guess this was our "babymoon" before our next child :) We left Friday morning and came back Sunday night. Friday we got into town around 3:00. We relaxed for a bit in our hotel room and then went to dinner and a movie at a new shopping center down the street from the strip. It was kinda like Victoria Gardens. We had a very yummy dinner at The Yardhouse and then saw "The Hangover". It was SO funny and we both ended up enjoying it a lot.... it was way funnier than we even thought it would be. It is one of those stupid comedies, but we love those :) Here is a picture of us right before dinner taken by Matt. Matt eating his jambalaya. He thought it was very tasty.